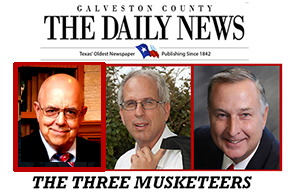 You Are Here: Home > Galveston Daily News Columns > Are Non-Citizens Voting? We don’t know how many of you read letters to the editor on a regular basis. We read them because they’re a window into what people are thinking. And no, we don’t always agree with what people write! Recently we read a letter from Gary Miller of Texas City and a response by David Hedgepeth of Galveston. Both raised an issue we find interesting: Whether non-U.S. citizens should, or actually do, vote. It is illegal for a person who is not a U.S. citizen to vote. That’s a true statement here in Texas and nationwide. Thanks David for making it! However, that doesn’t mean non-U.S. citizens aren’t voting. It’s true that a prospective voter must check a box on his/her voter registration card that says he/she is a U.S. citizen. The problem is, nobody verifies whether that statement is true. Let us give you an example. In the 2016 primary election a voter presented himself at one of Galveston County’s early voting polling locations. The election workers looked up the person in the poll book and did not find his record (i.e., he was not a registered voter). When he was told, this the voter said he had voted previously on numerous occasions and he couldn't understand why he wasn’t registered. The Election Judge decided to do some investigating and discovered the voter had been called to jury duty. When called he told the court’s judge he couldn’t serve because he wasn’t a U.S. citizen. Acting appropriately, the District Clerk’s office notified the Galveston Voter Registrar’s office that the gentleman in question was not a U.S. citizen and the Voter Registrar’s office subsequently removed him from the registration rolls. After discovering this information the Election Judge asked the voter whether he was a U.S. citizen and he said he wasn’t. The problem is that this non-U.S. citizen had voted in four previous elections. In the 2015 legislative session representative Mike Schofield (R-Houston) introduced a bill that would have required voter registrars across the state to verify a person’s citizenship prior to officially registering the prospective voter. A hearing was held on the bill but no further action was taken. Given what a federal judge did to the Voter ID bill, it’s unlikely the Texas legislature will seriously consider such a measure in the 2017 session. However, that doesn’t mean they shouldn’t. The integrity of the election process here in Texas could be threatened, if the incident here in Galveston County turns out to be just the tip of the iceberg. To be clear; every person who is legally eligible to vote should be allowed to and nobody should put roadblocks in their way. At the same time we should not allow non-citizens to vote. It’s a matter of integrity and integrity is really important!